Dr. James H. Grimes attended the University of Puget Sound where he earned a Bachelors of Science degree in Biology in 1971. After graduating from the University of Puget Sound, he attended the Southern California College of Optometry and earned his Doctor of Optometry Degree in 1975. After earning his optometry degree, Dr. Grimes returned to the Pacific Northwest to practice at Kornmesser Optometry Clinic. He has been serving the Olympia and Shelton communities since 1975. Dr. Grimes' focus is on family practice optometry with an emphasis on ocular disease and contact lenses. He is certified to diagnose, treat, and manage diseases of the eye and use therapeutic and pharmacological agents. He also does pre- and post-care cataract and laser refractive surgery. Public service is important to Dr. Grimes, and he has held several leadership roles. Dr. Grimes was president om 1980 to 1983 of one of the state's 13 societies. It incorporates Grays Harbor, Lewis Mason, Pacific and Thurston Counties. From 1984 through 1987, he was state trustee from District 5, which includes all of Southwest Washington from I-5 to the coast. In 1990 he was elected vice president of the state society, was president-elect in 1991 and was president in 1992-1993. In 1994, he was appointed by Governor Michael Lowry to a three-year term on the sate board of optometry, which governs licensing for optometrists. In 1997 he was reappointed by Governor Gary Locke. At the same time he was appointed by the state president to fill a three-year term as a director of the Great Western Council of Optometry, which included all western states except California. After three years, he became presiddn of that council, which then added California. His local community service includes support of scouting he has sat on the Eagle review board. He has also served on city committees for critical-use and shorelines areas as part of the growth management process. 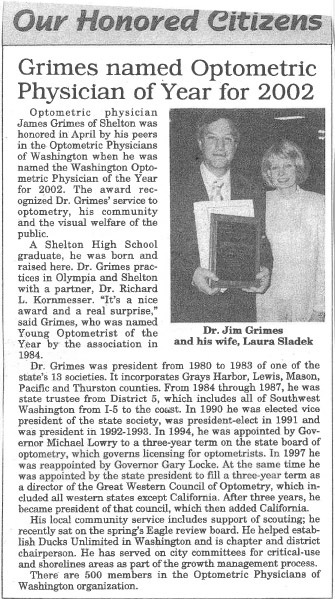 Dr. Grimes' has been recognized for his service to optometry, his community and the visual welfare of the public. He is the recipient of three prestigious awards. In 1984 he was voted Young Optometrist of the Year. Then,in 2002, he was voted Optometric Physician of the year. In 2005 he was voted Optometric Physician of the year for the Great Western Council of Optometry, which includes all the western states except for California. In his free time, Dr. Grimes enjoys outdoor sports, including hiking and skiing, reading Shakespeare, and spending quality time with his wife, family and friends. This clinic was founded by Dr. Henry Kornmesser in 1938, making it one of the oldest optometry clinics in Washington State. In 1975, Dr. Henry Kornmesser's son, Dr. Richard L. Kornmesser took over the practice. Dr. James H. Grimes is the current president. This clinic has been in its present location since 1986.